Two months at sea, and still alive! 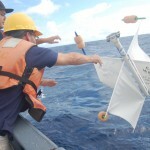 College of the Redwood’s drifter, deployed two months ago, continues to hang on and is now off the coast of Mexico (http://www.nefsc.noaa.gov/drifter/drift_redwoods_2010_1.html). Its course has generally paralleled the California coast with only two major exceptions. North of Point Reyes the drifter reversed its course and spent several days heading north before resuming its southerly trend. When the drifter reached the Gulf of the Farallons it spent more than a week wandering within the Golden Gate shipping lanes. Since its escape from the Gulf of the Farallons the drifter has been heading steadily southward. More recently the drifter has been showing signs of a potential early death. For days at a time the drifter has failed to broadcast its location. Then, somewhat miraculously, it would raise its head and tell us where it was. At this time it has become reliable again, reporting its position every four hours. Surprisingly, it has once again struck out in a new direction. For the last week, the drifter has been creeping ENE on a beeline for Ensenada, Mexico. Has it overcome its buoyancy problems, or has it been recovered by a fishing vessel that is slowly working it’s way back to port? One of the real joys of this project has been puzzling over the factors affecting the drifter’s wanderings. Every day has produced new mysteries and revelations. It appears that College of the Redwoods’ drifter is slowly dying. NOAA’s drifter guru, Jim Manning, feels that the drifter’s flotation may have been damaged. The drifter is probably partially submerged and is no longer transmitting its location. It has been over a week since its last transmission, about 75 miles offshore from San Luis Obispo. 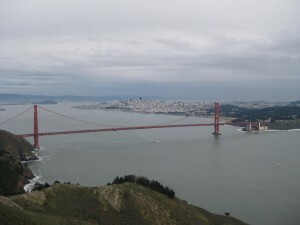 Then, miraculously, the drifter reported its position WNW of San Diego the day before yesterday (http://www.nefsc.noaa.gov/drifter/drift_redwoods_2010_1.html)! Perhaps a fortuitous wave tipped the GPS unit out of the water for a moment at the precise instance of a position burst. The drifter may still be in the game! Unfortunately it is unclear if, or when, it may transmit its location again. In any event, Mexican waters appear to be next on the itinerary. After 28 days adrift, College of the Redwoods’ drifter is poised to reveal some insights into a long-standing mystery. 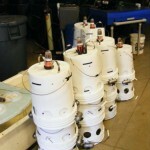 Marine science students at CR have deployed hundreds of drift bottles over the last 25 years. The bottles contain a card asking the finders to record the location in which they recovered the bottle, and send the card back to us. In that time we have developed a fairly good idea of where California’s coastal currents are likely to carry our bottles. During our storm season, the nearshore Davidson Current tends to transport our bottles northward. We have very high recovery rates during those times in northern California, Oregon, and Washington. On occasion our bottles have made it as far as British Columbia and Alaska. The Davidson Current tends to be best developed between mid-October and mid-February, but southerly storm winds in late spring and early summer often produce the episodic, short-lived appearance of the Davidson Current. The California Current, on the other hand, sweeps close to shore during much of the rest of the year. Our drift bottles are usually carried southward during these times. If you’ve been following this blog, you’ve undoubtedly noticed that our drifter has been swept over 200 nautical miles southward in the last month, successfully avoiding all of the most common stranding sites. During this time of year, most of our drift bottles are recovered along the Mendocino, Sonoma, and Marin County coastlines (counties that are north of the Golden Gate). Some of the bottles are carried south of the Golden Gate as far as Monterey County. The farthest south any of our bottles have ever been recovered is Big Sur. Our drifter is now about 40 n.m. offshore along the Monterey coastline and rapidly approaching the latitude of Point Sur. For the last 25 years, the burning question has been, “Where do the bottles go if they don’t strand north of Big Sur?” Two of our bottles were recovered (several years apart) in the Philippines, but we have no other recoveries south or west of Pt. Sur. So, at long last, our drifter is on the verge of shedding some light on the mystery of where the surface currents carry our drift bottles. Finally! After a solid week of meandering around in the Gulf of the Farallons dodging tankers, warships, and fishing boats, CR’s drifter has been recaptured by the California Current and is heading south. The drifter has been sailing steadily southward for the last three days, and is now halfway between the Golden Gate and Monterey Bay. The Monterey Bay, however, presents a new set of challenges. The currents there are notoriously variable as witnessed by Monterey Peninsula College’s two deployments of their drifter over the last seven months (See their posts from November 17th of last year and February 3rd of this year). The excitement is building here again as the drifter approaches its next aquatic hurdle. Wake up Deidre, there’s some jetsam heading your way! Students in the Marine Science Technology Program (MST) have recently built and deployed an ocean drifter designed to study California coastal currents. The drifter is a four-and-one-half foot tall by four foot wide structure made of PVC pipe, vinyl “sails” and a package containing a satellite transmitter. The drifter is designed to float just below the surface of the ocean so that its path is largely unaffected by the wind. A satellite tracking device protrudes above the ocean surface so the path of the drifter can be monitored by MST students, scientists and the public. It was dropped into the Pacific Ocean on Tuesday May 11 with the help of the F/V Trek II about two miles offshore of Noyo Bay. The students have been waiting for ideal oceanographic conditions to drop the drifter to utilize the dominate California Current that flows from north to south, fueled by a northwest wind pattern. Strong northerly winds also foster coastal upwelling that pushes surface waters offshore. Upwelling brings cold, nutrient-rich waters to the surface and sustains the tremendously diverse coastal ecosystem along the Mendocino Coast. Information gathered by the drifter will be used in future MST Program classes, such as the Oceanography class that will be offered this coming fall semester. Even if ocean currents force it up on the beach, the drifter can be recovered and redeployed unless it is too damaged. Funding and support for the project came from the Marine Advanced Technology Education (MATE) program in Monterey via a grant from the National Science Foundation. Scientists from Woods Hole Oceanographic Institute in Massachusetts provided materials and technical support to assist CR students to assemble the drifter, and the federal National Oceanographic and Atmospheric Administration (NOAA) has donated the satellite time to track the drifter. College of the Redwoods’ drifter has taken “playing on the freeway” to a new level. For the last four days, our drifter has been wandering around in the inbound and outbound shipping lanes (there are six of these) to the San Francisco Bay . Two hours ago it moved to within 10 nautical miles from the mouth of the San Francisco Bay and directly into the only major inbound shipping lane that goes under the Golden Gate Bridge! The NWS offshore forecast for the next four days calls for more unseasonal southerly winds (is this really MAY? ), which could once again subject our valiant drifter to the possibility of being pushed back northward and onshore. Thus the potential for a visit to the Big City still remains a possibility. Both of our local newspapers published articles on the drifter project (one on the front page), and tracking the drifter has become an obsession for many members of the general public as well as our students. Thanks to each and all of you (especially Jim Manning & Deidre Sullivan) that are responsible for making this project happen! For the first 5 days after deployment, strong NW winds fueled a current that carried College of the Redwoods’ drifter at speeds of well over 1 knot. Those winds died down on Sunday and postponed our hopes of the drifter making it past Point Reyes. The past 36 hours have becalmed our drifter, and it has become a waiting game. A weak front is predicted to slip through the area today, and with it will come southerly winds. Southerly winds could produce a northerly current, and more significantly, an onshore flow. The front is predicted to move through quickly, and our usually reliable NW winds should return tomorrow. Today produces another round of anxiety among the students and staff following the journey of the drifter. Will it be driven onshore today, or will tomorrow’s northwesterlies power our drifter past Point Reyers? Regardless of the drifter’s immediate fate, the drifter has proven to be one of the most dynamic and powerful teaching tools I ever had. Each day’s odyssey has been a string of teaching and learning opportunities for all of us. The excitement is building in our lab, as our drifter skirted by a major geographic hurdle. In our past studies Point Arena has captured many of our drift bottles. Early this morning the drifter we deployed two days ago ( http://www.nefsc.noaa.gov/drifter/drift_redwoods_2010_1.html ) successfully avoided the clutches of the Point and is continuing southward. The excitement is palpable in the lab and classroom. Students and staff are huddled around their computers for the position updates every 4 hours. Cheers actually broke out when the drifter missed Pt. Arena. Now we’re watching its course as it approaches the next big roadblock, Point Reyes.